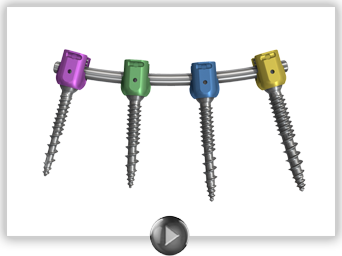 The Threshold V2 Pedicular Fixation System was designed to efficiently treat a wide variety of spinal pathologies through an open or guide wireless MIS approach. The system features a multi-start, quick advancing corticocancellous screw thread pattern, a wide variety of implant options, and intuitively designed instrumentation. Designed to treat single or multi-level degenerative, mild deformity, and trauma applications using an open or guide wireless MIS approach. True self – tapping, quick advancing thread pattern increases OR efficiency and reduces the physical demands of screw placement. The system includes a wide variety of Screws, Rods, compatible Cross-Connectors and Rod to Rod Connectors to meet the demands of the procedure and accommodate the needs of the patient.